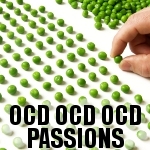 If you have a website, a homepage, or a blog, and you like OCD OCD OCD Passions, we'd love it if you would consider adding a link to us. Since we're 100% free the best way for us to grow is by word-of-mouth, and by links from other sites, especially 'Obsessive-Compulsive Disorder' websites. If you are interested in promoting OCD OCD OCD Passions via our Affiliate Program, you can find information on the Passions Network affiliate program here. If you have an affiliate program for a website and/or a product that would be of interest to the Obsessive-Compulsive Disorder community, please contact us with information on your affiliate program.